I love March. I love March for the fashion magazines that come out in March. March, like September, is a big month in the Fashion magazine world. It’s right after Spring Fashion Week and the fashion magazines are stuffed with the new seasonal looks. All of Mia’s clothing is based off items I saw in InStyle with a focus on things that were part of the minimalist collections that have been on the runway as of late, especially from Micheal Kors, Carolina Herrar and Ralph Lauren. I didn’t want to do pattern and I didn’t want to do anything elaborate, I wanted to focus on shape. I’m really pleased with all the clothes, but a little less pleased with the doll. I decided to make her a Mia after I finished drawing the whole set, because I haven’t done a Mia yet this year, but once I finished her I realized that I have done a very similar hairstyle before for Mia before. 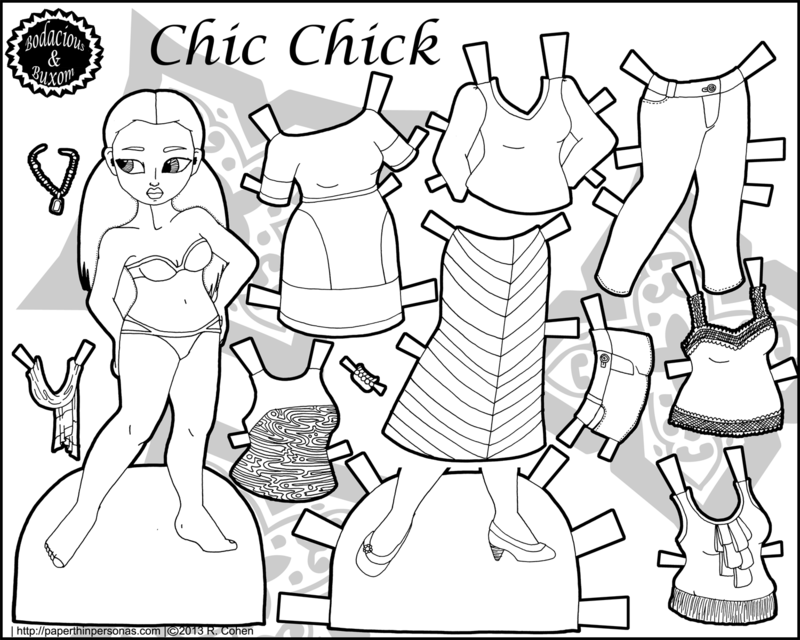 Anyway, I’m still pleased with this paper doll set and very excited to color it. It’s going to be a lot different I think than any other set I’ve done which is, to me, exciting. It’s a Margot paper doll this Monday, the first for the new year, I think, and she’s sporting some stylish garb from the 10th century. 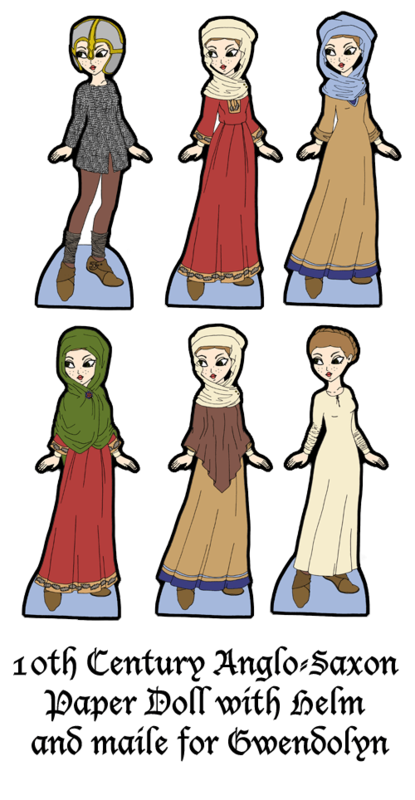 Yesterday, I posted a pretty long ramble about 10th century Anglo-Saxon women’s dress and if you’re interested, I recommend reading that as well as this post, since the two rather go together in chronicling the epic research adventure this paper doll was. One of my January drawing winners, Gwendolyn, who asked for this paper doll has been very kind as I slowly did my research and then set to work on drawing the set. I won’t pretend it hasn’t been both stressful and time consuming, because it has, but I am utterly pleased with the outcome and I hope she is as well. I have actually thought a little bit about what I would choose if I ever won, so I can tell you now that I am interested in a Marisole-family doll, who is 10th century Anglo-Saxon. I would love a set or two of daily clothes, but I would also love a maille shirt and helm. Speaking of the maile shirt, it is based on Anglo-Saxon finds in York and the helm is also based on the same thing. As women didn’t wear maile, I didn’t spend a huge amount of time researching the historical accuracy of such a garment. Personally, I’ll confess, armor doesn’t get me going like clothes do. So, let’s talk about the clothes. As I explained yesterday, 10th century Anglo-Saxon’s women dress consists of several layers of clothing. To begin with Margot (our Anglo-Saxon model with a French name…) wears a pair of leggings with windings around the calves and shoes. The shoes come from Anglo-Viking finds in York dating from the 9th Century. The windings around her calves are based on an illustration from the manuscript Psychomachia (British Library MS Additional 24199) which shows a barefoot women on horseback. Sadly, the manuscript hasn’t be digitized, but there is an illustration in Owen-Crocker’s Dress in Anglo-Saxon England. There is no way to know what the top of such leggings looked like. I made them like this so they could be worn with the maile shirt. The shift’s neckline is based on an illustration of a male farmer’s tunic illustrated in Tiberius B v calendar (British Library MS Cotton Tiberius B v, fol. 4r) and the sleeves are wrinkled as I discussed yesterday. The necklines of the other dresses are also based on the necklines of men’s tunics in the 10th century. The veils are based on manuscript illustration, though I had added visible pins. Pins are commonly found from this period and it seems logical they were used to hold veils together. The green veil with broach is based on an illustration of the Virgin Mary from the first half of the 9th century (see Plate 1). The brown “poncho” is based on several illustrations and I discuss these cloaks a lot more in yesterday’s post. Lastly, the embroidery on the red dress is not based on anything specifically. I wanted to use some patterns I found online, but they were far to detailed to easily make tiny enough to work as illustrations at such a small size. I did not include girdles as there is almost no published information on them and I didn’t want to just invent stuff. The colors used in these garments are based on the colors of the famous Bayeux Tapestry (which is not actually a tapestry, but that’s neither here nor there). Faye has decided to do a little time traveling and visit the 1920’s. I love drawing 1920s paper dolls and this one was no exception. Inspired by Anna May Wong (the first Asian-American famous film actress), I knew I wanted to use Faye, my Asian Mini-Maiden in this set. Faye has shoes, stockings, a girdle, a house dress, two day dresses and then a swimsuit. She should probably also have a swimming cap, but I didn’t really think about that until after I finished the set and then it was too late. But she’s got a pretty good set of 1920s clothing to print and color, I think. I really had fun with this set since I just bought a few more books about 1920’s clothing and wanted an excuse to play with them. I’m trying to give more information on where I do my costume research when I say something is historically accurate, so I’m including a sources list, in case anyone else wants to dabble in the 1920s. It’s not exhaustive. There’s some other great books out there, just what I happened to use for this set and have on my own shelves at home. 1920s Fashions from B. Altman & Company. Mineola, NY: Dover Publications, 1999. Atelier Bachwitz. Classic French Fashions of the Twenties. Mineola, NY: Dover Publications, 2012. Blum, Stella. Everyday Fashions of the Twenties as Pictured in Sears and Other Catalogs. New York: Dover Publications, 1981. Lussier, Suzanne. Art Deco Fashion. Boston: Bulfinch/AOL Time Warner Book Group, 2003. Peacock, John. 20th-century Fashion: The Complete Sourcebook. London: Thames and Hudson, 1993. Do people find this idea of sources lists useful? I don’t want to do them all the time, but for my historical stuff I thought it might be helpful for folks. Thoughts from my fabulous readers? 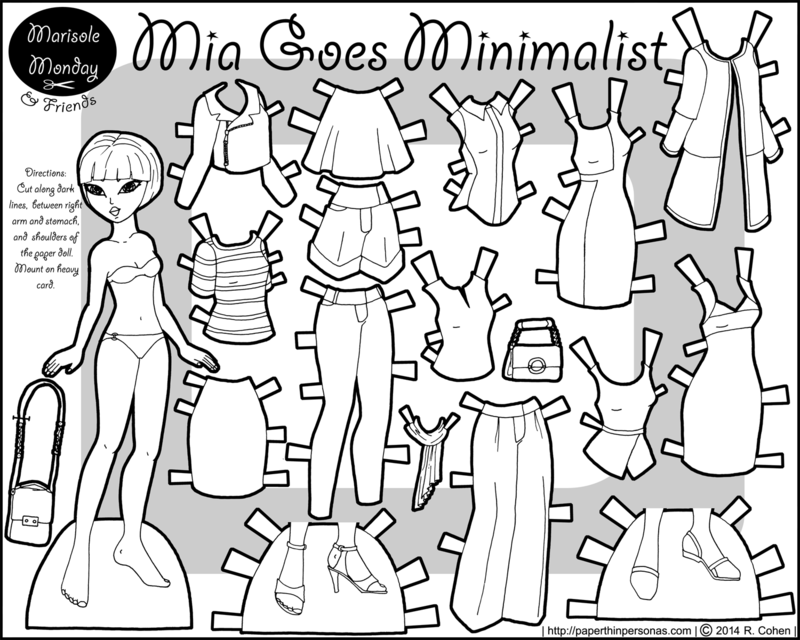 So, last week I was feel very meh about this paper doll set. Now, I’m rather in love with it. I have a very on again, off again relationship with my paper dolls sometimes. I mean, if I was dating this blog, I would definitely declare the relationship highly unhealthy. As it is, the Blog is a demanding associate. Anyway, I have decided on a name for this new “face” of Marisole. I’m calling her Magnolia, after the magnolia trees that aren’t blooming at all in the dead of winter in Alabama, but which are beautiful anyway. She’s stuck in the Other Friends category though until I decide if I like her enough to draw more sets for her. I went back and forth and back and forth about Magnolia’s skin tone. I wanted to something darker than my standard Marisole skintone. I’ve posted before about my Skintone Pallette which I use to select skin tones for the blog. Now I was going to go with my darkest color which is #3b2219 which, as you can see, is a very dark brown. 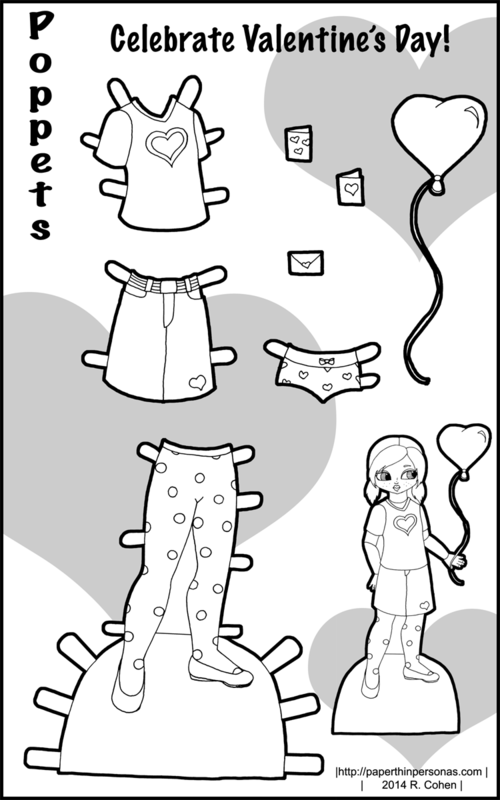 The trouble with #3b2219 is that it makes seeing the black lines on the drawing nearly impossible, especially when you print out the paper doll. So, I lightened the skin-tone to a new shade which is #502e22 which I like a lot better, though it lacks the richness of the darker brown. I want to use #3b2219 more, but I am having trouble with it allowing the line-work to show up. I need to think about how to fix that problem in the future. Oh and before I forget, I want to wish a happy President’s Day to those celebrating here in the United States. 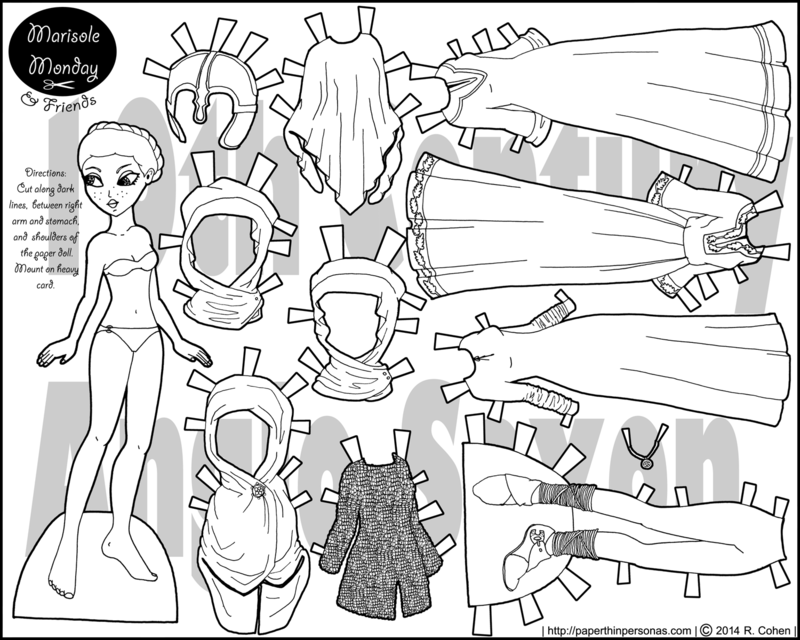 Today’s Marisole Monday & Friends paper doll is a little futuristic and a little cyberpunk. She has a new face which I like I think, though I’m not sure about it. Drawing new faces for Marisole is a struggle for me. Drawing for Marisole at all right now is a struggle for me. In fact, I kinda hate Marisole right now. Don’t get me wrong…I’m proud of the 96 or so versions of Marisole I have drawn and I’m pleased she’s been a ninja, a fairy and an alien (not to mention plenty of other things), but lately I’ve been feeling uninspired when it comes to her. I think a big part of my frustration is that I drew this base doll over four years ago which is a long time to be drawing for the same doll. Working on her is like going back in time to a style I drew a long time ago and don’t anymore. Some days, that feels very odd. Before anyone freaks out, I’m not saying I’m not going to continue with Marisole style dolls, I just feel very much in a slump. The wheel in spinning, as they say, but the gerbil may be dead. Advice for getting out of slumps, anyone?